Errors in text and legend to Figure 3. 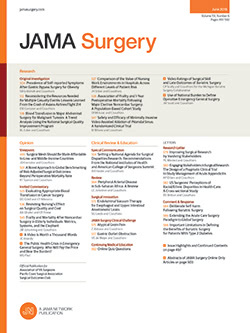 In the article titled “Risk Factors for Anastomotic Leak and Mortality in Diabetic Patients Undergoing Colectomy: Analysis From a Statewide Surgical Quality Collaborative,” by Ziegler et al, published in the July issue of the Archives (2012;147:600-605), some patients were incorrectly described on pages 603 and 604. In the legend to Figure 3 on page 603, the second sentence should read “Among known diabetic patients, only preoperative steroid use (3 of 34 patients who did use steroids [8.8%] vs 16 of 850 patients who did not [1.9%]; P = .03; odds ratio, 4.60 [95% CI, 1.25-16.9]; 65% power) was significantly associated with anastomotic leak.” In the first complete paragraph on page 603, the third and fourth sentences should read “Among known diabetic patients, only preoperative steroid use (3 of 34 patients who did use steroids [8.8%] vs 16 of 850 patients who did not [1.9%]; P = .03; odds ratio, 4.60 [95% CI, 1.25-16.9]; 65% power) was significantly associated with anastomotic leak (Figure 3). For nondiabetic patients, preoperative steroid use was not significantly associated with anastomotic leak (10 of 178 patients who did use steroids [5.6%] vs 124 of 4035 patients who did not [3.1%]; P = .09; 47% power).” In the third sentence of the following paragraph on page 603, the sentence should read “Among nondiabetic patients, the risk of mortality more than doubled (8 of 134 patients with a leak [6.0%] vs 100 of 4079 patients without a leak [2.5%]; P < .05; 64% power), whereas among diabetic patients, the risk increased by a factor of nearly 6 (5 of 19 patients with a leak [26.3%] vs 39 of 865 patients without a leak [4.5%]; P < .05; 88% power) (Figure 4).” On page 604, the fifth sentence of the first complete paragraph should read “The risk of an anastomotic leak for nondiabetic patients who did use steroids (odds ratio, 4.60) was twice as high as that for nondiabetic patients who did not (odds ratio, 2.30).” This article was corrected online.